The entrance to Amenemhet III's pyramid. Isometric view. Looking towards the northwest corner. The last great quartzite ceiling slab was lowered to close the vault by an ingenious device. Sand which had supported props holding up the block was released via side tunnels, allowing the huge piece of stone slowly to descent to its resting place. 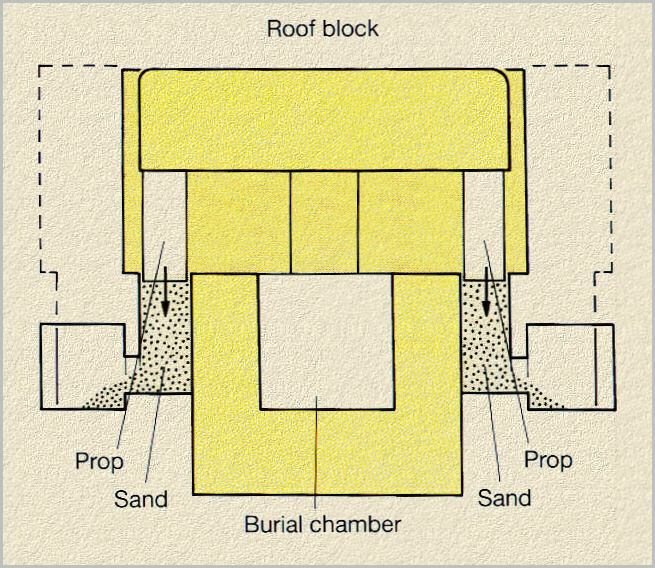 The burial vault of Amenemhet III was protected by triangular lintels, gabled beams and a mudbrick vault. 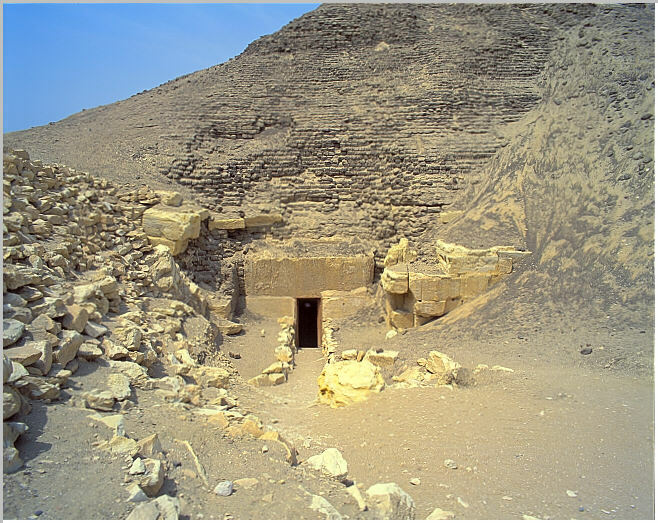 The entrance to Amenemhet III's pyramid, is on the west corner of the south face of the pyramid. The pyramid's interior is now inaccessible due to the high water table. It is lined with very large limestone blocks and was originally directly on the face of the pyramid. It led down a stairway to a level deeper than the burial chamber. At the bottom of the stairway is a small chamber from which a short passage leads to a dead end. Amenemhet III's builders then elaborated a device used in the Abydos tomb of Senwosret III: a route to the burial chamber continues as a short passage hidden in the ceiling. It was intended to be blocked by a massive slab of quartzite, weighing 20 tons, that could be slid sideways from a niche in the wall. 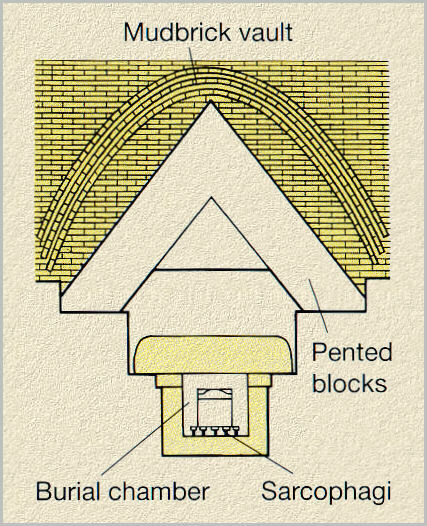 The ceiling passage leads to a second chamber, from which two passages depart. The first runs directly north. Petrie Thought it was another blind passage and that and difficulty exploring it because it was filled with mud and water. The mud is probably is probably disintegrated mudbrick that filled the passage. 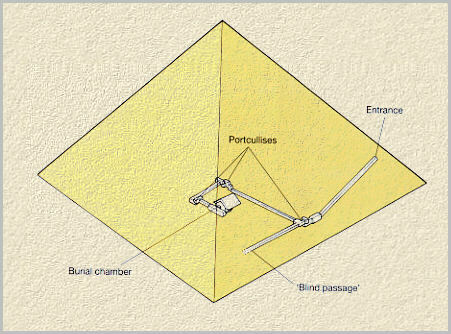 It is possible that the so-called blind passage might in fact lead to a south tomb, like that in Dahsur pyramid. The second passage , once closed by a wooded door, makes a right angled turn and runs directly east. At a point just under the southeast diagonal of the pyramid is a third chamber. After another right angle turn the passage continues, hidden again in the ceiling and intended to be closed by another large quartzite slab. The third such arrangement is under the northeast corner, the only one closed by its quartzite blocking slab. From here a short passage leads to an antechamber. A channel in the center of its south wall opens into a trench containing the burial chamber, slightly west of the pyramid's center. The burial chamber is a technical marvel and completely innovatory. It is beautifully carved from a single piece of hard sandstone or quartzite, in the form of a rectangular 'tub', measuring 7 x 25 x 1.83 meters high , set into an open trench. This was a considerable accomplishment since Petrie estimated it weight 110 tons. Before roofing the chamber, the king's quartzite sarcophagus, its plinth decorated with niches, a second smaller sarcophagus and two canoptic chests were placed in it. although working under difficult conditions - the chamber was submerged in ground water - Petrie reported findings bits of bone inside the coffins. In the antechamber Petrie found an alabaster offering table elaborately carved with with depiction's of food with hieroglyphic labels, and duck shaped bowls. 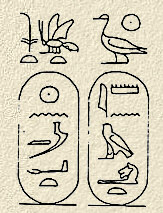 These objects bore the name of princess Neferu-ptah. From Djoser to Amenemhet III, the male ruler, at the center of a pyramid cemetery , was surrounded by royal woman and it is the women's tombs that have given us some of the richest discoveries as well as the greatest puzzles of the pyramids - Neferu-ptah presents on of these. With a reduction in the number of chambers under the pyramid it may have been a logical development that Amenemhet III favorite was buried with him in his burial chamber - two queens' tombs were were incorporated within the substructure of his Dahshur pyramid. . However, in 1956 another tomb for Neferu-ptah was found, southeast of Hawara, with a red granite sarcophagus inscribed with Neferu-Ptah's name, along with other other objects. In the water logged sarcophagus, were traces of two wooden objects along with fragments of linen bandages. The mystery of Neferu-ptah is heightened by the fact that the pyramid burial chamber could be closed only once. Its roof was composed of three large quartzite slabs, one of which was popped up on smaller blocks to leave a space to introduce king's (and queen's) mummy and coffins. In order to close the burial vault, The Hawara builders installed the first known sand lowering device.